As part of the recent celebration of its 24th anniversary, Hamas held a mass rally in Gaza in which the terror group expressed an intransigent commitment to the jihad against Israel. In his speech at the rally, Hamas' Prime Minister Ismail Haniyeh called for the establishment of "the al-Quds Army for the liberation of Palestine." "We are sending today a clear and unequivocal message that the armed resistance and the armed struggle are our strategic choice and way in order to liberate the Palestinian land from the sea (Mediterranean) to the river (Jordan) and to expel the intruders and plunderers from the land of Palestine," said Haniyeh. "Hamas will lead with this (Palestinian) people and the steadfast resistance organizations Intifada after Intifada till the liberation of Palestine is accomplished." 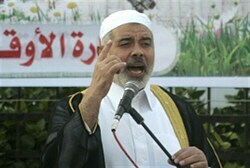 Referring to the issue of the Arab refugees, Haniyeh conveyed a determined message to the communities of PA Arabs outside of "Palestine" by saying, "You are the first priority of our national movement and its jihadist and political activity, as the right of return is enshrined, non-negotiable, cannot be waived and no one has the right to negotiate over the right of return." Hamas' refugees department praised Haniyeh's speech and emphasized that al-Quds (Jerusalem) is "the heart of Palestine" and its liberation is "tantamount to the liberation of all the land of Palestine from the impurity of the Jews the plunderers." In an announcement published on Hamas' official website on Monday, Hamas' refugees department suggested that the Arab refugees would be the pioneers of the future al-Quds Army. All Arab states, and particularly those which host the refugees, were called upon to take the initiative to start building the "Arab Liberation Army." The first steps in this direction, according to Hamas, should include recruiting volunteers to the future al-Quds Brigades in each Arab country and establishing a supreme military command which will be assigned to draw the liberation plan of Palestine militarily and politically. Hamas' refugees department also stressed that the Palestinian people will spearhead the confrontation with Israel, saying that "We are confident that the battle to liberate al-Quds (Jerusalem) is closer than ever and that we are nearing a victory with the support of Allah."